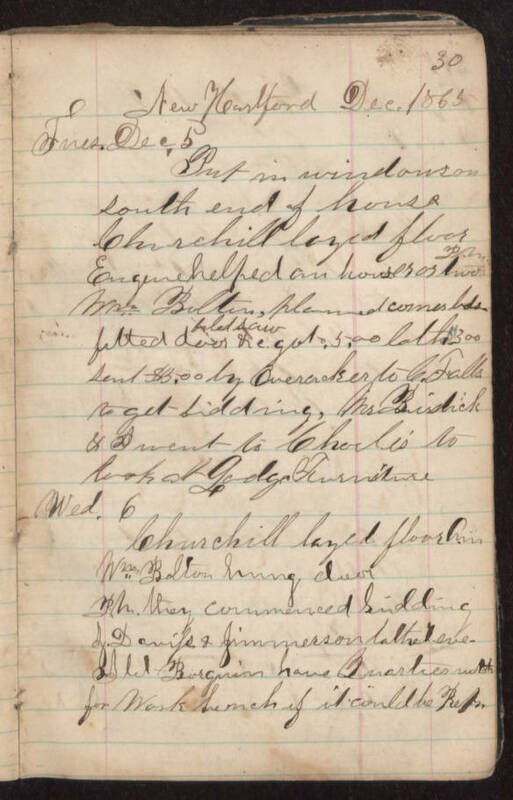 New Hartford Dec 1865 Tues. Dec. 5 Put in windows on south end of house Churchill layed floor Eugene helped an hower or two P.M. Mr Bolten, planed corner bds fitted door filed saw &c got 5.00 lath $300 sent $5.00 by Overacker to C. Falls to get bidding, Mr. Birdick & I went to Charle's to look at Lodge Furniture Wed 6 Churchill layed floor A.M. Wm. Bolton hung door P.M. they commenced (Sidding?) J. Daviss & Jimmerson lathed eve. I let Burgeson have Quarties watch for work (bunch?) if it could be rep.